Day 502 - Milestone Reached! We are very, very blessed that Everett has been such a great sleeper since returning to Maryland. However, this evening he continued to cry even an hour after bed time. 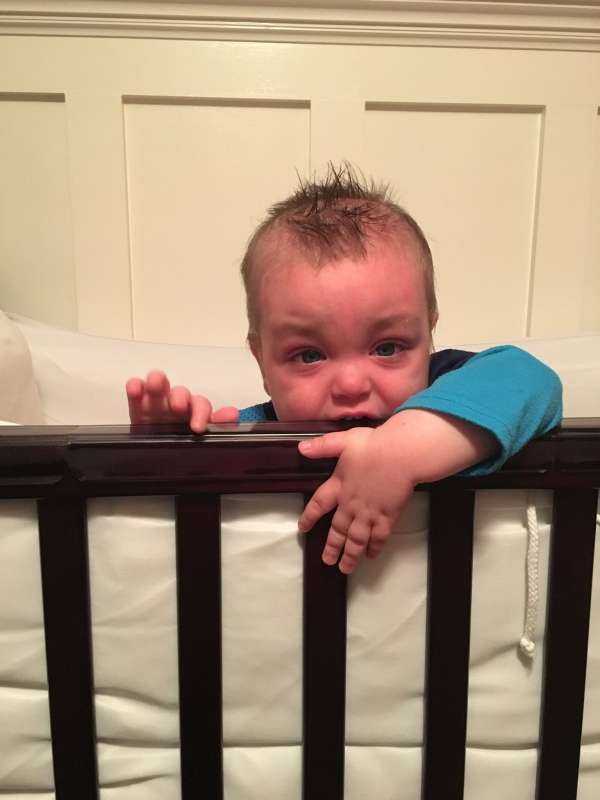 When Mommy went in to check on him, she found him standing in the crib and close to falling out! This may not seem like much, but for Everett to pull himself to a standing position (especially since we've covered the crib bars with padding to protect his head), it is a very huge deal. The strength and coordination required to pull his body weight to the height of the crib is something we were not sure he would ever be able to do. We are thrilled to endure our own sleepless evening to witness this milestone and certainly don't mind lowering a mattress at 1am. NOTE: Picture below is actually only Everett kneeling and not standing...Mommy just wanted to check to see if he would do it again, but she was way too scared he might fall out to let him stand up.